So much food, so little time. With all the amazing food we put together on Thanksgiving, does anyone ever get great food shots? This is about the only picture I have of Thanksgiving dinner. I was just too busy enjoying myself. About sixteen of us came together at our friend’s house this year. Surprising to many, I did not cook Thanksgiving dinner. I was in charge of stuffing, pie and some wines. But wow did we feast. Our friend’s cooked an amazing meal….turkey, ham, an incredible sweet potato dish, green beans, mashed potatoes, gravy, homemade bread and we had enough dessert to feed at least 900 more people. We opened all the favorite Thanksgiving wines, Riesling from Oregon, Germany and California…Gewurztraminer and of course lots of Pinot Noir. Honestly after dinner I laid flat on the wood floor for awhile to help aid in the digestion process. I was stuffed. It was wonderful. Now, if you have never been to the Oregon wine country on Thanksgiving weekend, you are truly missing out. 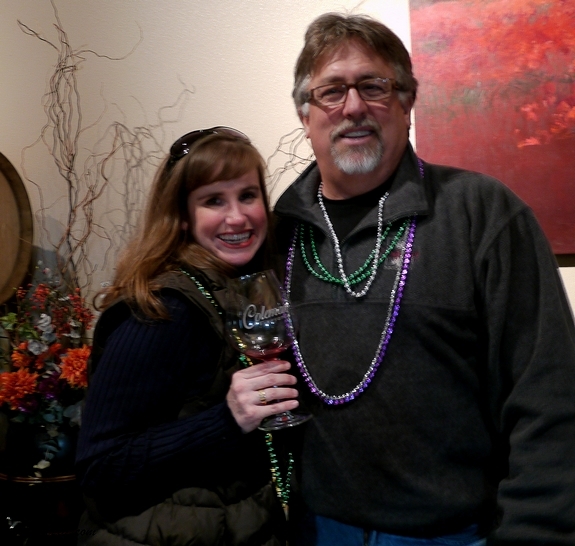 Every winery, even those not usually open to the public, put on a great party. There is food, great wine and even entertainment at some places. This was the spread at Maysara this year, it was another feast with offerings such as pork carnitas, lamb meatballs with tzatziki sauce, beef with mushrooms, all kinds of salads and a quince jam I would love to have the recipe for. I could go on and on about the food they had to go with their wine tasting, it was heaven on a plate. We are so glad Maysara is just located over the hill from our property, they make some amazing wines you just have to taste. 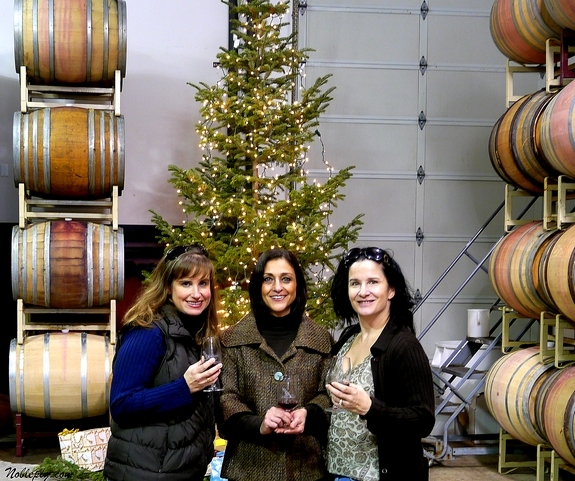 Here are myself (left) and Flo (middle), owner of Maysara and Nicolette, owner of Youngberg Hill Vineyards and Inn, one of the most beautiful bed and breakfasts in the valley and makers of some incredible Pinot Noir as well. I’m definitely in very good company with these ladies. Three of my favorite Maysara wines. I’m sure you would love them too. After we left Maysara, we headed over to our other fabulous friend’s winery, Coleman Vineyard. 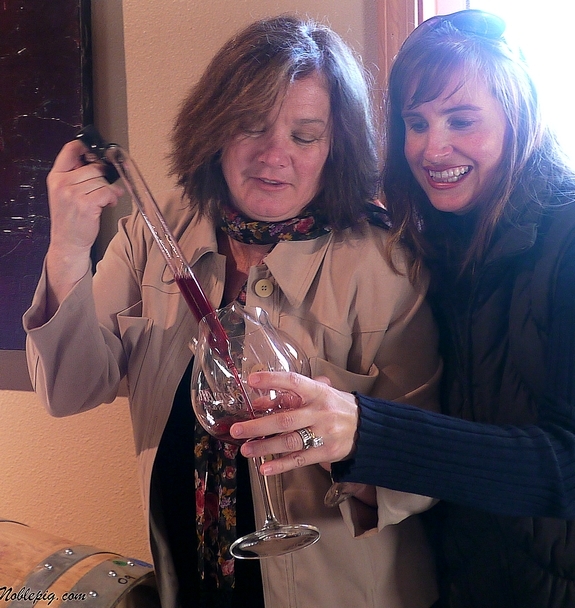 Here Kim Coleman is letting us sample the Pinot Noir that was just barreled down over the past weeks. I honestly can’t put in words how good the 2009 vintage has turned out to be. I was tasting the same wine, made with the same yeast but now beginning its aging process in two different types of oak. Both were incredible. However, if you’ve ever had the Coleman’s wine, you would know, it’s always incredible. Here Randy Coleman gave me my Mardi Gras beads, we just had a great time. And guys, I think I ate all your salami while I was there…it was so good. Sorry. 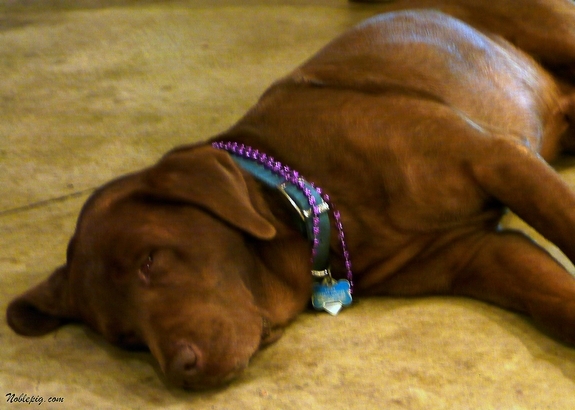 Even the Coleman’s dog had Mardi Gras beads and he was definitely tired out. Now, in regards to our own vineyard property, it has been raining here in Oregon for about the last 25 days straight through Thanksgiving day. 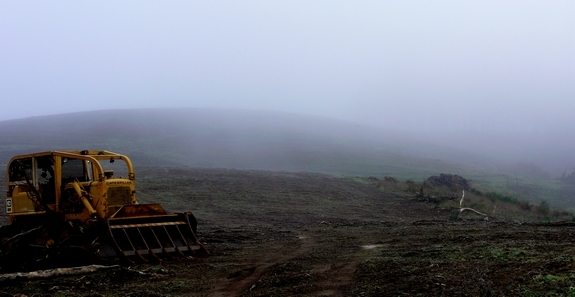 Weather like this makes it very difficult to get work done in the mud. However, for the past few days it has been dry and will continue to be dry for another few days if we are lucky. This has allowed us to get out in the very dense fog and cool temperatures (about 45 degrees) and take some GPS measurements and monitor areas that are water logged and will need better drainage. All of this in anticipation of Spring planting. And even though it’s not raining, this is the residual mud left on my boots after I wiped most of it off. You should see the bottoms. Cathy, I do believe you have found your *home*… an entire community of talented people (like you) who like to like one another & are good at what they do. What more could you ask for? Nothing but best wishes to you my friend. Cathy, your weekend sounds incredible. We visited the wineries to the south of us on Sunday and really enjoyed that. The wines are always good, the food gets better every year. Looks like a perfect Northwest weekend to me! 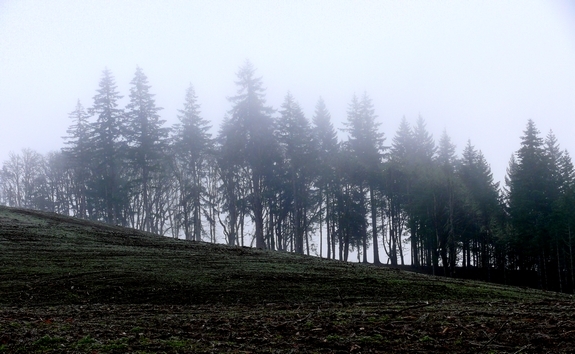 You should come visit us on Whidbey lsland just a few hours north of Seattle, beautiful–even in the rain! I am so enjoying following your adventures in establishing your new home and winery in Oregon, and seeing you with your friends and enjoying the bounty of what Oregon wine country has to offer. I was just telling some friends that I needed to stock up on some wine. It seems to have become my beverage of choice lately! I’m going to look for the Maysara wines! p.s. I got about 6 photos over Thanksgiving break! I did little baking and took no food photos! I’ve added those wines to my list! I think it is SO exciting to watch your journey as you continue on the path to your dreams. I LOVE these peeks into the process, and imagining what your life must be like! Holy moly. Looks like a great weekend, including the mud. 🙂 And the Mardi Gras beads. I love this! California seems like a few lifetimes ago….I want to come stay in one of those Inns! That Pinot Noir looks heavenly. I would love to taste it right out of the barrel like that. Thanks for sharing your photos, Cathy. Thanksgiving weekend is great for wine tasting, but OMG, the traffic. Dungeness crab season opens today. Watch for a huge, start of the season sale at Fred Meyer. Last year, $2.99 lb. and they were heavy. Wow, look at all the fun you are having. I had no idea this goes on in the Oregon wine country during Thanksgiving. I am putting this on my to do list. I have to order wines from these three places, assuming I can place an internet order. I want to stay at that Inn too! What wonderful photos! Cathy, I think you have found heaven on earth. 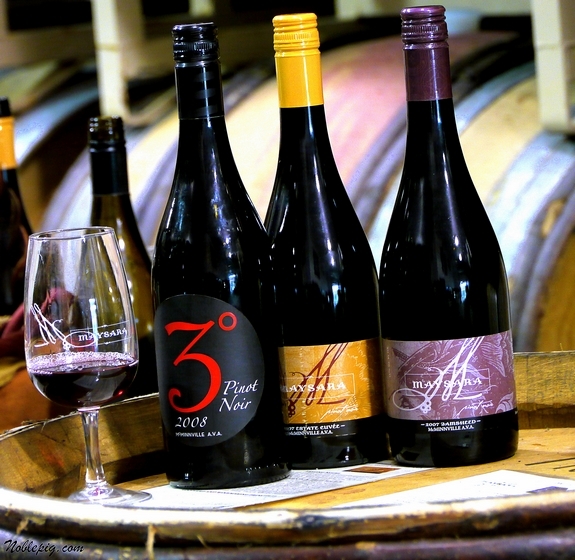 I can see you are in great company and the way this winery venture plays into the lives of your family is remarkable! Such a learning experience at the same time, and you all seem perfectly suited for your new lifestyle. Our weekend was also filled with delicious food. We hosted the family gathering this year and I have to admit it was a lot of work for me….but I survived and it was a huge success. So successful, I assume I will be hosting most Thanksgiving gatherings for the family from now on. It was such a great weekend, I even managed to put up a Christmas tree the day after Thanksgiving. The first in our new home. I am quite pleased with it, and look forward to the rest of the holiday season. I want to take this opportunity to wish you health and wealth during the new year and successful winery projects. Glad you had a good time! I wish I could go to wineries for Thanksgiving! Heh. I love your weekend updates. I didn’t take many pictures of T-day either. doesn’t help that my good camera is broken. Sigh! I made 4 big desserts for 7 people! Crazy. Crazy good. Ewweee, the mud! But so fun to see you fulfilling your dream. Well – I spent most of my weekend flat on my back trying to sleep off the cold that my darling husband gave me. It almost worked – I still have the remnants. Your weekend certainly looks better – mud and all! Talk about a perfect weekend – driving around the Oregon countryside, great wine, great food! Bliss! I’ve got nothing that’ll compare to that – oh it rained in Tucson! A bit. Finally. Wow, I have a friends coming to the Oregon Wine country next month and I just sent her this post. She was very excited and wants to visit the wineries you mentioned. It sounds like you had a wonderful holiday weekend. What a wonderful weekend! 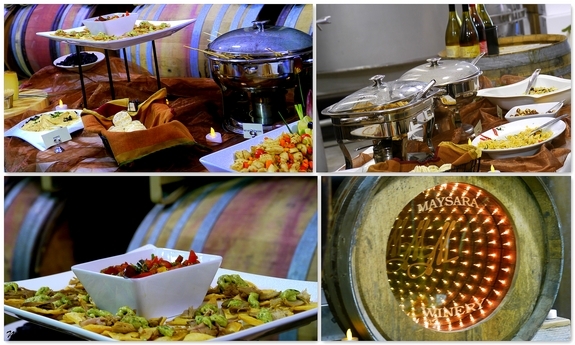 Good food, good friends and most importantly – good wine! wow, looks like you had a fabulous time over Thanksgiving. I’m happy for you. Hope you are able to work on your vineyard more! From bleached blond California girl to mud baby. Life is good. Glad you had a wonderful weekend. Thanksgiving weekend is all about family and friends. Mardi gras beads and sleeping dogs just add a certain flair. I had a wonderful weekend being extremely busy doing things I love! Looks like you had a wonderful time too!I never have Thanksgiving pictures either, there is just to much to do to take pictures! Wow, thanksgiving in the Oregon wine country sounds awesome! We had Riesling to go with our turkey too, but probably not as good as yours! Looks like a great feast! You live well, which is why I love coming here to visit! I feel like I’ve known you forever even though we’ve never met. Looks like you had a great holiday weekend. The pics are wonderful. Love all the barrels! And of course the wine and dog too!!! Wonderful post! I so enjoyed your photos. I agree- it’s really hard to get food photos at a holiday dinner. Other family members are not quite so patient as our own. Rain seems to be a problem everywhere. I related to the muddy boots thing since I get a similar layer on my boots at the barn (with the bonus of horse manure). This is the rainiest year of my life. I really believe that. What a beautiful weekend. Sounds like you had a perfect Thanksgiving. You had lots of good friends and good food – and you didn’t have to cook it all! What a wonderful time of year to go tasting! Here we are working between the rains too. Only we are trying to get fencing completed before winter sets in. What great pictures! I love that the winery’s open up and have food and stuff, how fun is that? Do you mind so much rain or do you miss sunny skies? I’m sure when its all said and done though, your vineyard is going to be amazing! I had a great thanksgiving, just the hubby and kids, my turkey turned out great and we played lots of games afterwards which is always fun! What a great Thanksgiving weekend. 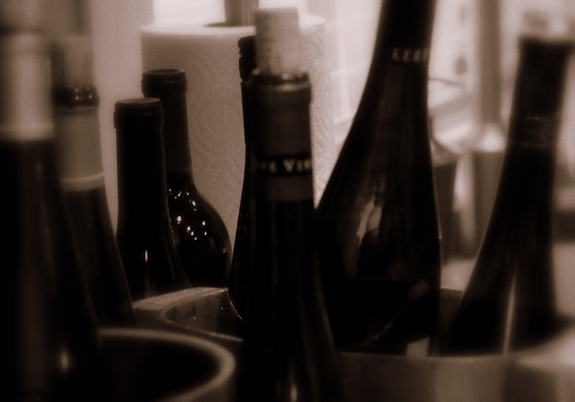 I would love to have soent the weekend in wine country with good food, good friends, and great wine! Glad you had a great weekend! Maysara Delara is my absolute favorite Oregon Pinot. Can you believe I’ve made two trips to Oregon Wine Country and have not stopped at thier winery. This means only one thing….another trip.